The Shallows is a movie about a young woman trying to survive out in the water until help arrives. While she waits, she is fighting off a shark that caused her to go into survival mode in the first place. The lovely Blake Lively plays Nancy, a girl who has lost her mother and for the moment, wants to get away from that drama and her own personal life to travel and have fun and hopefully in the end make things a little bit better. She is taken to a secret beach in Mexico, by Carlos (Oscar Jaenada) a local who at first seems to be a little sketchy. She asks what the beach is called several times, but jokingly keeps getting turned down with the answer. Not only does Carlos deny the answer, but also two other locals she meets surfing with, does the same thing. But at this point it doesn't matter. Nancy gets in her surfing attire, says goodbye to her ride and has a fun time surfing the waves in this beautiful secret place. Towards the end of the day, Nancy decides to do one more wave, which at that point I thought was a bad idea. She discovers a dead whale and it has been fed on for quite some time by some predator. Turns out that predator is a shark and he is pissed. The rest of the movie she is stuck on a rock and has to try and survive until help arrives. 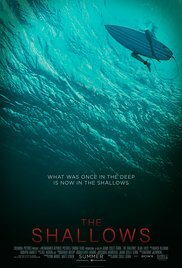 There's really not much to The Shallows but what made it so intense was how terrifying they made it seem to go up against a shark and how powerless one person can be against one. It reminded me of Jaws a little bit. You see Nancy struggle to survive and the hardships she endures. If you are looking for something intense and a story about survival I would not miss this. Also, the shark wasn't bad either.